Thomas Merton (January 31, 1915 – December 10, 1968), was an Anglo-American Catholic writer and mystic. A Trappist monk of the Abbey of Gethsemani, Kentucky, he was a poet, social activist, and student of comparative religion. In 1949, he was ordained to the priesthood and given the name Father Louis. 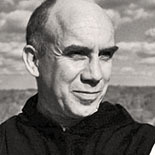 Merton wrote more than 70 books, mostly on spirituality, social justice and a quiet pacifism, as well as scores of essays and reviews, including his best-selling autobiography, The Seven Storey Mountain (1948), which sent scores of World War II veterans, students, and even teenagers flocking to monasteries across the US, and was also featured in National Review’s list of the 100 best nonfiction books of the century. Merton was a keen proponent of interfaith understanding. He pioneered dialogue with prominent Asian spiritual figures, including the Dalai Lama, the Japanese writer D.T. Suzuki, and the Vietnamese monk Thich Nhat Hanh. Merton has also been the subject of several biographies. "Love is our true destiny. W..."
"Prayer and love are learned..."
"The silence of the forest i..."
"To deliver oneself up, to h..."
"We stumble and fall constan..."
"What I do is pray; how I pr..."
"What a thing it is to sit a..."